Twenty three year old Samantha, Diane’s eldest daughter, is part of the World Class Programme for elite athletes with Olympic potential. She has been riding at Turville her whole life and grew up riding the Lusitano horses, learning all of the advanced movements from a young age. At 13 she got Spring Pascal, a just broken 5 year old, from Wales and started training him with the help of Diane. Ten years later she has taken Pascal to two Junior European Championships and now competes at International Grand Prix on him, she is the youngest person to ever reach the BD National Championships at this level. She spent a year working for and riding with Carl Hester where she was given the ride of Carl Hester and Aram Gregory’s horse, Douglas IV, who she took to the Young Rider European Championships. 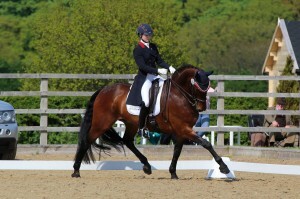 She is now taking on training liveries at Turville Valley Stud as well as teaching both at Turville and in the surrounding area. She is happy to teach any level as well as in hand work.